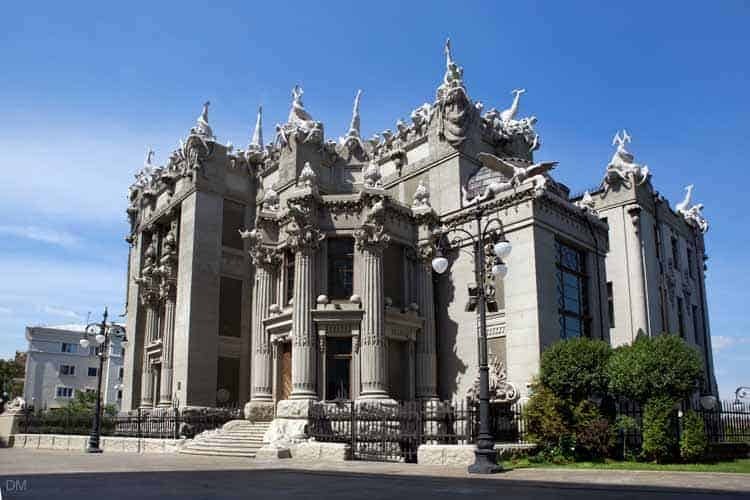 The House with Chimeras (Gorodetsky House) is one of the weirdest, but most popular, buildings in Kiev. It was designed by eccentric architect Vladislav Gorodetsky and completed in 1902. The distinctive Art Nouveau building is decorated with a multitude of exotic animals and creatures such as elephants, rhinoceroses, and dolphins, added because of Gorodetsky’s passion for hunting. The house is situated on Bankova Street in the Lypky neighbourhood of Kiev, opposite the office of the President of Ukraine. The House with Chimeras is used for government and presidential receptions and is not open to the general public. Map showing location of Gorodetsky House, Kiev – House with Chimeras. I’ve always wanted to see inside this building. Do you know if it is possible? To be honest I really don’t know. You certainly can’t just walk in or even pay on the door. I’ll try and find out on my next visit to Kiev if there are ever any special tours organised. It’s not mentioned here but there’s a statue of Gorodetsky not too far away. It’s an interesting piece of art because the statue is of him sat at a table drinking tea. There’s a spare seat and you can join ‘him’. It’s on Passage, a little street just off Khreshchatyk. Short clip showing the exterior of Gorodetsky House and some of the other buildings on Bankova.